Be Fab Be Creative are a reactive digital fabric printing bureau, printing on a range of cotton, linen, silk and bamboo - specialising in small, bespoke orders. 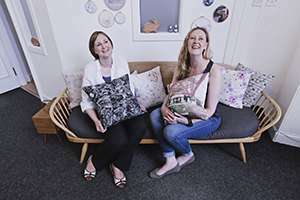 Typical clients include a wide range of established designers, design students, small businesses and designer makers who have a passion for fabric. A basic understanding of the process is fine, but it is great if you understand technical specifications for your project (e.g file types or quantities). You can upload jpeg's to their website up to 50mb, For larger files they use Tiff format (so please contact them for instructions for sending). The width of the fabrics varies, and fabric types can dictate the length of a single piece that can be processed. BeFab Be Creative was set up by two sisters based in Edinburgh who want to print your beautiful fabric, it's that simple! They started in 2012 and wanted to make digital fabric printing as accessible as possible.